This might sound like a strange thing to write about, the choosing of a colour palette for a thermal image. Why be concerned about which colour to use? Isn’t it just for presentation? It happens to be one of my pet peeves with thermal imaging and how people new to the field do not appreciate how a colour choice might enhance small differences in temperature and overemphasize something rather minor. 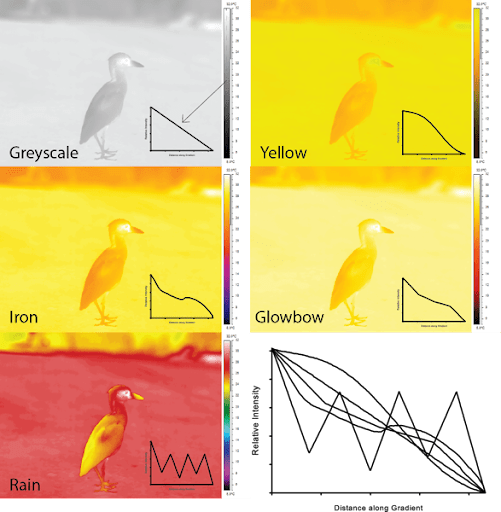 From left to right, these palettes are described as: Greyscale, Iron, Rain, Glowbow and Yellow (terminology comes from FLIR™). Each palette ‘translates’ temperature into a specific colour, with cold colours at the bottom (typically darker colours) and warm colours at the top (typically lighter colours). 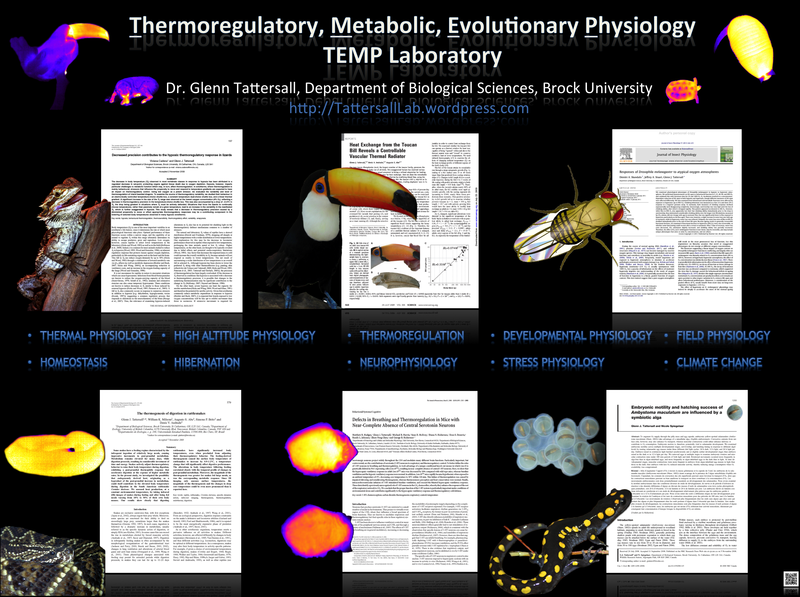 At first glance it might be tempting to choose the funkiest colours, since it looks ‘pretty’ (this is a common reaction I get from people when I show them thermal images). Indeed, for some purposes this is entirely appropriate. Some palettes were designed specifically to create a large contrast in colour intensity across a narrow range of temperatures. So, why all the fuss about palette choice? Let’s consider the same image as I’ve shown you above, but this time using 5 different palettes. I have purposely rescaled the image to range from 5 to 32C, which actually masks some of the potential colour differences but it also shows how the different palettes may obscure potential temperature differences. The picture above shows the yellow crowned night heron depicted using 5 different palettes. Inset line graphs depict the “intensity” of the gradient scale used in common units. All I did was import the images into ImageJ and drew a line down the gradient to obtain the “grey intensity” as a function of the colour palette. All palettes are compared in the lower right-hand graph to show how these different palettes translate “intensity” differently. The other palettes however are not all the same as the greyscale. Sadly, my own favourite palette is shows a slightly curvilinear function with some intensities rising before falling again. The palette that comes closest to a greyscale, slightly monotonic decreasing palette is FLIR’s Yellow palette. Note how weird the Rain palette looks. The intensity rises and falls along the gradient itself. What this means is that your eye may be drawn to changes in achromatic signals in the colour palette and mistakenly consider them to be an incorrect temperature change. 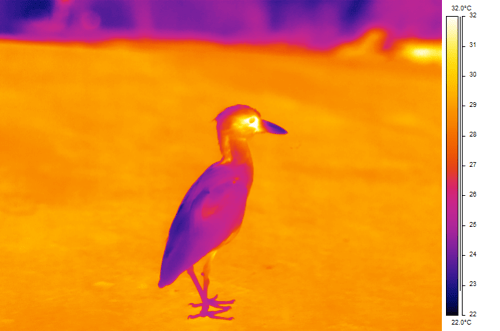 The Rain palette is an example of one of those favoured by people who initially play with thermal cameras. The images look striking, but my pet peeve about it is that it creates unnatural contrasts in colours that do not correspond to the actual temperature gradient. It also does not help that the beak and the back feathers look ‘warm’ because I am accustomed to yellow colours being warmer than red colours. For most of the palettes chosen (the first 4), the conversion to greyscale does not really obscure the image too much, but it still transforms the images. In other orders, darker greys clearly correspond to cooler colours, lighter greys to warmer colours. The exception is the Rain palette. 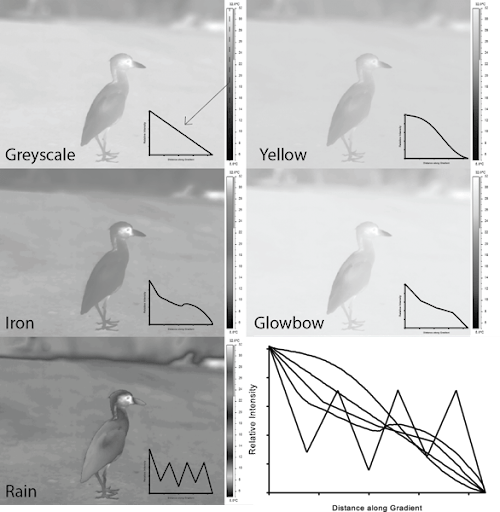 When converted to greyscale it appears saturated in some places, the bird’s image is nicely delineated (due to the steep contrast in intensity in places), but certain greys are repeatedly used that correspond to different temperatures. In other words, it is difficult to tell for certain what colour corresponds to what temperature.